Delegate Fee: €205 -Delegate fee for attendance at EdTech2010 on May 20th and 21st 2010. Includes lunch on both days. Speaker Fee: €175 -Fee for attendance at EdTech 2010 by attendees who are also speakers at the conference. Student Fee: €120 -Fee for attendance at EdTech 2010 by attendees who are registered students of a higher education institution. Conference Dinner: €20 -The conference dinner will take place on Thursday evening, at the award winning Olive Grove Restaurant, overlooking the River Shannon. All delegates, speakers and student attendees are strongly encouraged to ensure they sign up for the conference dinner, which promises to be a very sociable event. 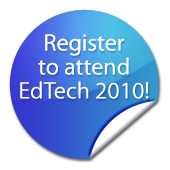 Registration online for EdTech 2010 via the Conference Submission System. Once you create your account (or use an existing abstract submission account), you will be promoted to pay for your registration using the secure online Paypal payment system, using a credit card. Go to the Conference Submission System to register.